Elisabet Sahtouris is an internationally known evolution biologist and futurist, speaking on all five continents; teaching Living Economies and Navigating our Current Crises. With a post-doctoral degree at the American Museum of Natural History, she taught at MIT, the University of Massachusetts, contributed to the NOVA-Horizon TV series, is a fellow of the World Business Academy with an honorary Chair in Living Economies, and an advisor to Ethical Markets. Currently a Professor in Residence at Chaminade University in Honolulu, she has convened international symposia on the Foundations of Science in Hokkaido and Kuala Lumpur. 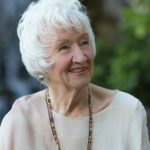 She is the author of EarthDance: Living Systems in Evolution, A Walk Through Time and Gaia’s Dance: The Story of Earth & Us, and is co-author with Willis Harman of Biology Revisioned. Dr. Sahtouris is also a co-founder of the WorldWide Indigenous Science Network, a Fellow of the Findhorn Foundation, and has appeared in numerous films.